Every so often, our favorite local store carries plantains, the banana’s larger, starchy cousin. My husband, who was in awe of the banana prices when he came over, looked at them and wondered how they were. When we went to the new Winco in Salt Lake, they had a pretty good price on them, so we picked up a couple to make a savory, non-potato-based mash. Plantains are an interesting banana. Unlike regular bananas, plantains must be cooked before consuming and the blacker they are, the sweeter they taste. Black plantains are very ripe and very sweet, best for desserts. Yellow and green plantains are best suited to more savory dishes. They’re starchy, often used like vegetables and a good replacement for potatoes. There are several ways to cook them, including making smashed plantain chips using a double frying technique. (Alton Brown does this on his show about plantains.) The fastest and easiest is microwaving, which I used, but you can also roast them instead. Though plantains are a relative of the banana, this mash is not sweet, so for this recipe, you want two green or greenish-yellow plantains. If you have picked out solid green plantains, that’s fine too. Save the black ones or black spotted ones for dessert. 1 cup water, veggie or chicken stock, milk, etc. Some sort of tasty liquid. Saute leek with thyme, crushed red pepper, salt and pepper over medium heat until soft and tender. Gentle browning is good. Remove to a medium bowl. With a paring knife, cut a long slit in the peel of the bananas. Wrap tightly in waxed paper or plastic wrap. Microwave for 5 minutes. Remove and carefully remove the paper/plastic wrap. Watch out for steam! When cool enough to handle, remove the peels. 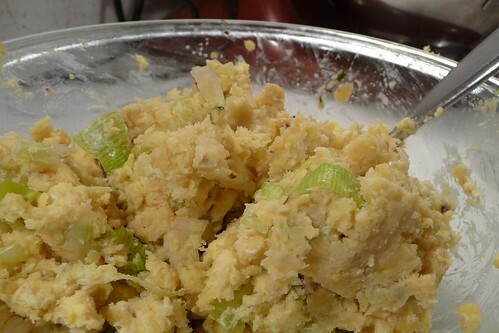 Roughly chop and add to leek mixture. Add liquid and sour cream. Mash well. Taste, add salt and additional liquid to taste. Serve. This entry was posted in american, recipes, side, untranslated, vegetable, vegetarian. Bookmark the permalink.